This is the week when most MLB teams have their official Photo Day, meaning that we have once again been graced with a bunch of pictures of professional athletes looking like awkward eighth-graders. We browsed through a bunch of this year’s crop and found our favorites. 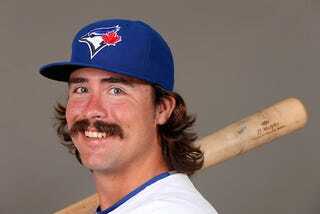 Blue Jays catcher Jack Murphy, who looks eager to fill his role as R.A. Dickey’s stunt double, will start us off. Photo Day is the best.